Halsey Burgund, Scapes :: July 13, 2010 – November 4, 2010 :: deCordova, 51 Sandy Pond Rd, Lincoln, Massachusetts. Halsey Burgund is a musician and sound artist who lives and works in Bedford, MA. Burgund’s projects are collaborative and provide participants with an active role in content creation. Part of generation Wiki and the democratization of knowledge, Burgund uses open source platforms, GPS technology, and interactivity to create musical scores from participants’ spoken words that continuously evolve in real-time. 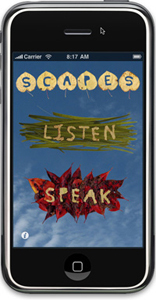 Scapes, Burgund’s project for PLATFORM 3, creates a two-way audio experience for museum visitors influenced significantly by their physical location on deCordova grounds. Participants will use handheld wireless devices and headphones to listen to audio and also to make their own recordings which will be immediately assimilated into the piece for everyone to hear. Organized by former Koch Curatorial Fellow Nina Gara Bozicnik and current Koch Curatorial Fellow Lexi Lee, the exhibition will be accompanied by a full-color brochure.